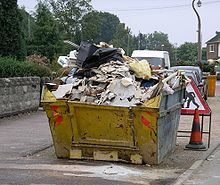 A skip (British English, Australian English, and New Zealand English) is a large open-topped waste container designed for loading onto a special type of lorry. Instead of being emptied into a bin lorry on site, as a wheelie bin is, a skip is removed, or replaced by an empty skip, and then tipped at a landfill site or transfer station. Typically skip bins have a distinctive shape: the longitudinal cross-section of the skip bin is either a trapezoid or two stacked trapezoids. The lower trapezoid has the smaller edge at the bottom of the skip bin, and a longer edge at the top. Where there is an upper trapezoid, it has the smaller edge at the top. At either end of the skip bin there is a sloping floor or wall. There are usually two lugs at the ends of the bin onto which chains can be attached, permitting the heavy skip bin to be lifted onto and off a lorry. A special skip-carrying lorry or crane is used. One end of the skip sometimes has a large door that hinges down to allow manual loading and unloading. Skips are usually durable and tough, made to withstand rough use by tradespeople and labourers. The size of skip bins can vary greatly depending on their use, with sizes ranging from small 2 yard mini skips to the very large 40 yard roll-on roll-off skips. Even though these large bins can store many tonnes of waste, most lorries are limited to carrying around 8 tonnes (8,000 kg) of material in the container. A typical small skip, when empty, weighs about 250 kilograms (550 lb). Open skips allow easier loading of waste materials and are commonly found on construction sites. Closed skips are more secure and prevent unauthorized use. They ensure that the volume of waste does not exceed the maximum limit. Roll-on and roll-off (RORO) skips are similar to open skips, but instead of being lifted onto a skip loader wagon by chains, they are rolled onto a wagon with a hook. They are more common as industrial containers and are not suitable for domestic use. Mobile skip bins are usually set on trailer with four wheels. A lifting mechanism is used to load and unload the skip from the trailer. Normal sizes used in Australia are 3m3, 4m3 and 6m3. However, sizes ranging from 8m3, 10m3, and 12m3 are also available for larger waste management jobs. Skips are commonly used to hold open-topped loads of construction and demolition waste, garden waste or other waste and litter types. The construction debris may originate from a building, renovation, or demolition site; building supplies can be delivered to a site in a skip that is later used to remove waste. Skips are also used for various cleaning-out jobs that need much material to be taken away, and at factories producing large quantities of scrap metal. The material in the skip may be taken to a landfill, recycled or recovered/disposed of in some other way. There are wide range of uses of skip bins including construction building, home renovations, handyman maintenance or repair projects, garden or green clean up. Skip hire companies typically print 'level fill' on the sides of skips to instruct users that the contents should not fill or have contents showing above the height of the sides of the skip. This is in part for safety so that contents do not fall out posing a risk to passers-by, and is also aimed at maximising revenue for the skip hire company. Many tradesmen and builders will make use of what are termed 'greedy boards', old doors and other scrap sheet based material, to artificially heighten the sides of the skip and thus get more value for money for tradesmen or builders. If they do that, the skip bin hire provider will charge them an extra fee as the skip will be overloaded. The origins of calling a rubbish cart a skip (most often found in Australia, New Zealand and the UK) come from the word 'skep', used to refer to a basket. 'Skep' itself comes from the Late Old English sceppe, from the Old Norse skeppa 'basket'.. While the first recorded use of a rubbish skip dates back to 1922, the practice of using skips to dispose of residential and commercial waste became mainstream over the following century, culminating in the modern skip waste disposal system that is used today.